I have started to tackle the book of Revelation again, in preparation for a Revelation seminar I will be presenting in the fall. This is a book that I have not spent a great deal of time grappling with. I have made attempts in the past but have not gotten very far. In looking through previous notes on my studies in Revelation, I came across these notes that I was keeping almost two years ago. I think there is something pretty good stuff in there. Wade through it if you’d like. There’s quite a bit. It’s all mostly based on word studies. iii. But were there only “seven” churches in Asia? 1. But John probably does this here because a) he was more than likely limited in his time/ability to send individual letters to all the churches b) he wanted all the churches to get the bulk of the vision, which is 19 out of the 22 chapters. i. Used 4x in Revelation. Here, and 3:1; 4:5; 5:6. This seems to be a reference to the Holy Spirit. What other Spirits could extend grace and peace? Seven is also the number of perfection and completeness. 3. Colossians 1:18 uses the exact same phrase, saying that Jesus is the “firstborn from the dead,” though it adds the word ek(from) after prototokos, whereas Revelation does not. 1. This is following the NU where it has the word luo(“to loose”). However, the TR has the word louo(“to bathe, wash”) instead. The latter word seems more likely, fitting the context better (since we are “washed . . . in His own blood”). The presence of the Greek en, before “his blood,” makes this likely. iii. In fact, the “all the tribes of the earth will mourn” is exactly the same—though it is different in the Greek. Matt 24:30 says “and then will mourn all the tribes of the earth,” (tote koyontai pasai ai fulai thj ghj) whereas Rev 1:7 says that “mourn because of him shall all the tribes of the land” (ai. ko,yontai evpV auvto.n pa/sai ai` fulai. th/j gh/j). ii. Thus, Revelation seems to be saying that those who crucified Christ will actually see Him coming in the clouds. ii. This phrase, of course, indicates completeness and totality—akin to someone saying, “From A to Z” in our modern vernacular. iii. The question is whether this statement is made by/about God, the Father, or Jesus. On the one hand, it seems to be about Jesus, since, intertextually (especially within the writings of John), Jesus often referred to Himself as the “I Am,” (cf., John 8:12; 10:7; etc.). Though the case is a bit weaker, there are two other examples of Jesus using the term “I Am,” and also being called “Lord” in the same instance. These are both in Paul’s conversion experience, recorded in two separate places, in Acts 9:5 and 26:15.
a. The way the Greek is constructed in this verse, however, makes me wonder if it could be translated this way: “I saw no temple in it, for the Lord God, the Almighty, is its temple and its Lamb.” I am not flawless in my Greek and I forget the rules of constructs when it comes to two nouns going together, so it may not work. But it does say naos autes estin kai to arnion. e. Suffice it to say, this verse does speak about God, the Father, but there seems to be enough ambiguity to perhaps allow for the idea that it may also be referring to Christ as well. ii. Ezekiel goes on to explain that each of them had “four faces,” and each had “four wings.” Their legs were straight, and the soles of their feet were like the soles of calves’ feet. They sparkled like the color of burnished bronze. iii. “These are the ones whom the Lord has sent to walk to and fro throughout the earth” (Zechariah 1:10). 1. Where/what is the “north country”? 2. It seems to be the location where God’s people are (Jeremiah 31:8). It is only used in this passage in Jeremiah, as well as Jer 6:23 and Zechariah 6:6, 8. 1. Cf. Revelation 2:10; 3:11, etc. 2. So being given a crown is a good thing! f. Question for future entertainment: why are there only four “living creatures” and four “horses” in Revelation 6? ii. But why don’t the last three seals have horses and living creatures? v. Thus, it almost seems like the righteous are always the ones being “slain.” But perhaps I am reading into it! vii. But in 6:9 it now talks about those who have been “slain” for the Word of God and for the testimony which they held. Is this the same group? It’s hard to quantify just how much of an impact a book has had on one’s life—especially when that book is judged against other books. But I got to thinking today about the books that have had the greatest impact on my life—outside the Bible and Spirit of Prophecy—and these ones came to my mind the quickest. It is these ones that I find myself going back to time and time again. They are the ones that have impacted my life more than any other—my theology, my worldview, my thinking, my living. The keen observer will probably notice that most of them come from the same genre and the same theological slant. This is further insight into my worldview. If you have not read any of the books listed, I would encourage you to run, not walk, to get them (links are provided for them for quick ordering access). And since it was so hard to narrow it down, I am providing my “Top 15” (it started with 10, then went to 11, then 14, and now, finally, 15). I am sure there are some that I have overlooked, and these may not be the exact order I would list them in a week or two. but it is what it is at this point. Without further ado, here are the non-biblical, non-SOP, books that have had the biggest impact on my life. The Return of the Latter Rain, by Ron Duffield. This work is so exhaustive and so eye-opening when it comes to the Seventh-day Adventist Church. It pulls the curtain back on where we are as a denomination. Then Shall the Sanctuary Be Cleansed, by Donald K. Short. In some ways, it has been easy for me to overlook this little book, but it cannot be understated how monumental it was in my realization of what Christ is trying to accomplish in the plan of salvation. It is small yet packs a powerful punch! Lessons on Faith, by A.T. Jones and E.J. Waggoner. This is a must-read for those who want to understand how to live the life of faith. I finally read it about three years ago and it was revolutionary in my thinking. The Good News Is Better Than You Think, by Robert Wieland. Though I have read numerous books of his, Elder Wieland’s preaching has really been more impactful on me, but this book probably stands out above the rest of his. Agape and Eros, by Carsten Johnsen. This powerful book is in many senses a response to Anders Nygren’s seminal work by the same name. It is an awesome vignette into God’s heart and character. It is deep, deep, deep, though, and may be a little challenging to follow for some. The recipient of multiple PhDs, the late Carsten Johnsen was a theological giant (and one of my dad’s biggest mentors). Can Man Live Without God? by Ravi Zacharias. Ravi Zacharias is to me what C.S. Lewis has been for a lot of other Christians: a convincing apologist for the Christian faith. This little book has been the most helpful for me in helping me realize that Christianity is not a blind commitment to illogical ideas, but a very reasonable and convincing worldview that makes more sense than the alternatives. It has also helped me to see that atheism is, in fact, an absurd and self-contradicting philosophy. Darwin’s God, by Cornelius G. Hunter. This book was eye-opening in helping me see that most Darwinists actually present theological and metaphysical arguments, rather than purely scientific ones. The Glad Tidings, by E.J. Waggoner. Both Waggoner and A.T. Jones have written numerous books that are worth mentioning, but I think this one stands out above the rest (besides the Lessons on Faith compilation, which has selections from both of them). 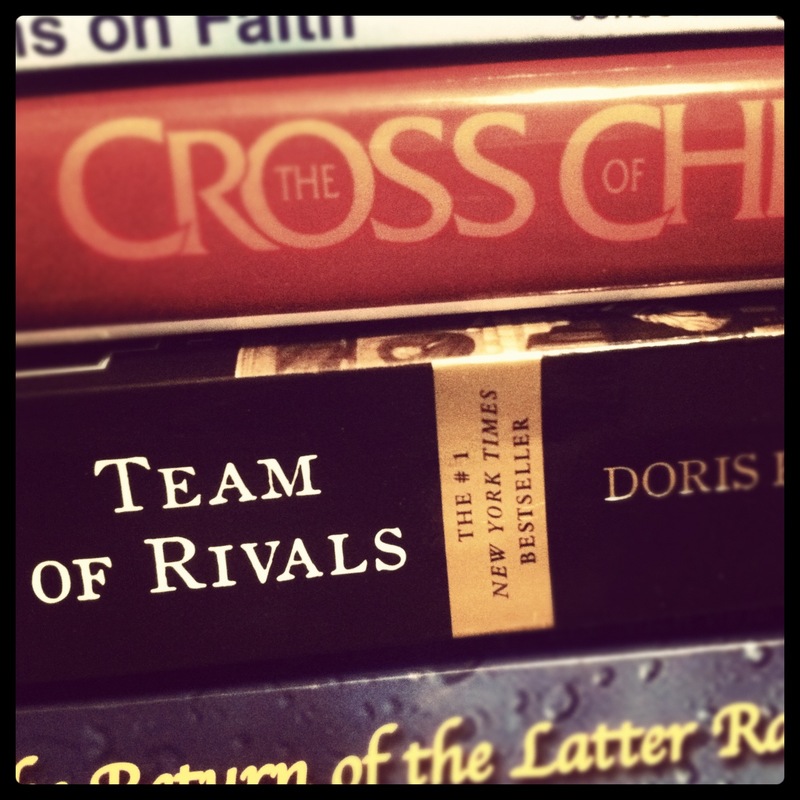 Team of Rivals, by Doris Kearns Goodwin. This is the most fascinating and exhaustive biography on Abraham Lincoln that I have come across. Goodwin is such a brilliant and fascinating writer and she provides amazing insight into Lincoln’s leadership skills and struggles. It is being turned into a movie and I am very eager to see it. What’s So Amazing About Grace? by Philip Yancey. I read this my freshman year of college and the wonderfully gracious presentation of Christ that Yancey presents is very compelling. Amazing Grace, by Eric Metaxas. This is a powerful, powerful biography of William Wilberforce. And Metaxas is one of the most brilliant writers I have come across (even though his biography on Deitrich Bonhoeffer has been somewhat of a letdown). As someone has said of Metaxas: he writes biographies like fiction (which, in this case, is a good thing). Should We Ever Say “I Am Saved?” by Herbert Douglass. Both this book and A Fork in the Road by Douglass have been very helpful in my thinking. The Cross of Christ, by John R.W. Stott. This is a monumental book when it comes to the atonement and the cross. The Knocking at the Door, by Robert Wieland. This connects the message to the church of Laodicea with the Song of Solomon in a powerful way that appeals to God’s lukewarm church to open the door to Him. It really was huge in starting my deep interest in the Song of Solomon. What about you? What books have been the most influential and impactful on your life?